Newly released video shows the last moments of a Louisiana man arrested for wearing “sagging pants.” Police pile onto him shocking into submission, then leave him lying face down on the jail floor for ten minutes. When they return, he is dead. A number of southern Louisiana parishes have banned pants that “fall below the hips, expose underwear or create indecent exposure,” with fines ranging from $25 to $100. The autopsy report described Edwards as “morbidly obese” and listed his cause of death as “acute cocaine and phencyclidine (PCP) intoxication in association with restraint by law enforcement.” Death investigators call the reasons of his death “undetermined”. 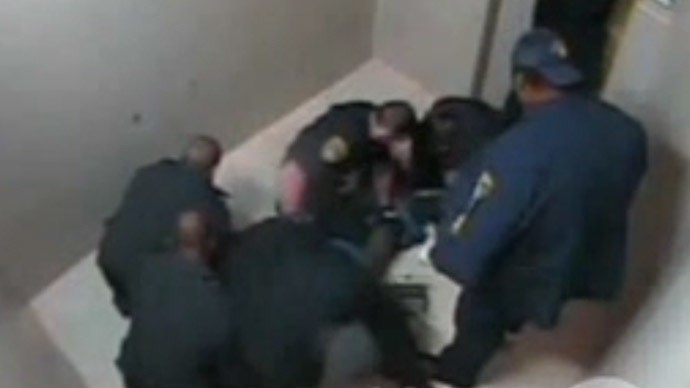 Footage from the jail surveillance cameras, released by the local newspaper The Advocate, shows Edwards being dragged into the cell by several officers, subdued by a stunner, and left motionless on the floor. The video, however, shows McMullan keeping the stun gun pressed firmly against Edwards for nearly a minute and a half. While the officers and jail staff present obstruct the camera’s view, a bright blue light can be seen between the stun gun and Edwards on several occasions during a roughly 45-second period, reported The Advocate. In the wrongful death lawsuit filed in February 2014, Edwards’ family said he suffered from high blood pressure, partial deafness and a mental disability. The lawsuit also claims Edwards’ girlfriend “begged” the officers not to shock him, telling them he had high blood pressure. Internal review of the events surrounding Edwards’ death did not reveal any criminal wrongdoing by officers or jail staff, the spokesman for West Baton Rouge Parish Sheriff’s Office told The Advocate. Police and correction experts interviewed about the video tend to disagree. Greg Meyer, a retired captain formerly with the Los Angeles Police Department and recognized nationally as a use of force expert, said the police should have asked for immediate medical intervention as soon as it was obvious Edwards had stopped moving. As for the pants that provided the pretext for the arrest, the police yanked them off Edwards and left them in the hallway of the jail. The video shows what appears to be a jail worker casually kicking them out of the way as he checks on Edwards, just before calling for medical assistance.